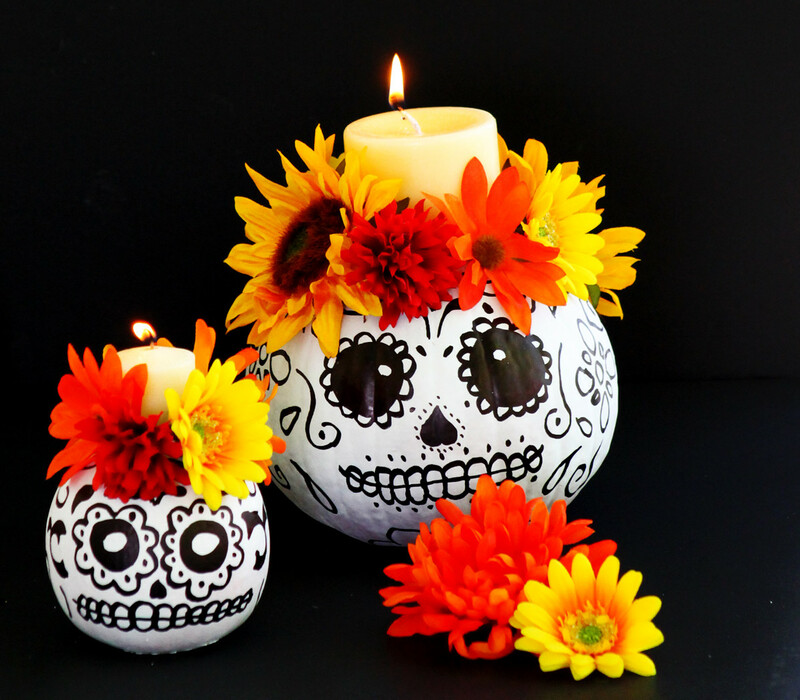 These Day of the Dead skull pumpkin candle holders are and easy DIY project that will make a fun centerpiece and are also ideal for a Day of the Dead altar. At home we celebrate El Dia de los Muertos or Day of the Dead, this holiday is all about celebrating life and on that day we remember our loved ones that have passed away. I really like that this holiday is a great opportunity to teach my children about appreciating life and the time spent with family and it’s a great way to follow on all of the spooky monster and zombie overload that comes with Halloween. 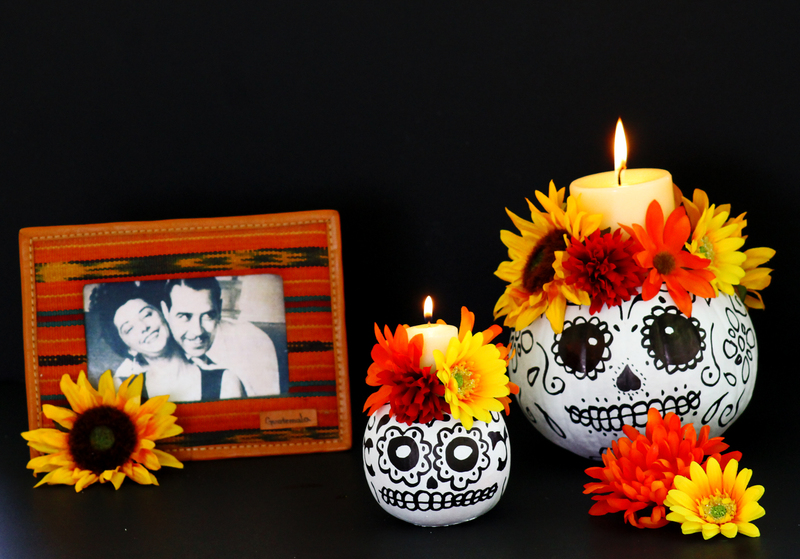 My kids love decorating pumpkins so we decided to create a set of Day of the Dead inspired pumpkin candle holders which we decorated with flowers and candles as the focal point for our Day of the Dead Altar. When we moved to the US from Guatemala we left all of our family and friends behind, we left our country and our traditions and embraced a new life in a new country with new traditions. In Guatemala we celebrate the Day of Dead by getting together with family and eating traditional dishes like Fiambre, visiting the cemetery and remembering our loved ones who have passed away. Since we move to the US we have also adopted some new traditions. Through these old, new and blended traditions we stay connected to that country and that culture that always is a part of us and we also strengthen our bonds not only with each other but also with our extended family who is far away and also with the family who is no longer with us. Cut the stem off each pumpkin. 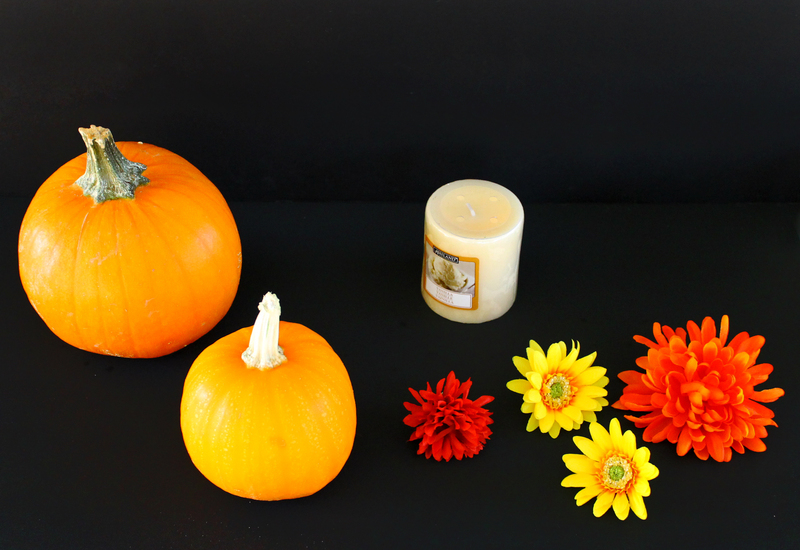 Center candle base on top of pumpkin and trace around it with the pencil. Carve out the circle remove the pumpkins seeds and pulp if you are using a real pumpkin. Spray paint the pumpkins white and let dry. Paint the sugar skull Day of the Dead inspired designs on the pumpkin with the Black Paint Marker. Insert the candle in the hole making sure that the candle extends 1.5″ to 2″ above pumpkin. Apply hot glue where candle and pumpkin meet to hold in place. We placed these on a table along with the picture of my grandmother and grandfather both of whom my kids did not get to meet. This is a great way to remember them and to talk about them with my kids as well as an opportunity to explain to them about death in a positive light and teach them the importance of celebrating life. How do you celebrate your loved ones that have passed away and teach your children about death? I would love to know. Check out more ideas for Day of the Dead celebrations on my Pinterest board below. Follow Growing Up Bilingual’s board Dia de los Muertos Day of the Dead on Growing Up Bilingual on Pinterest. 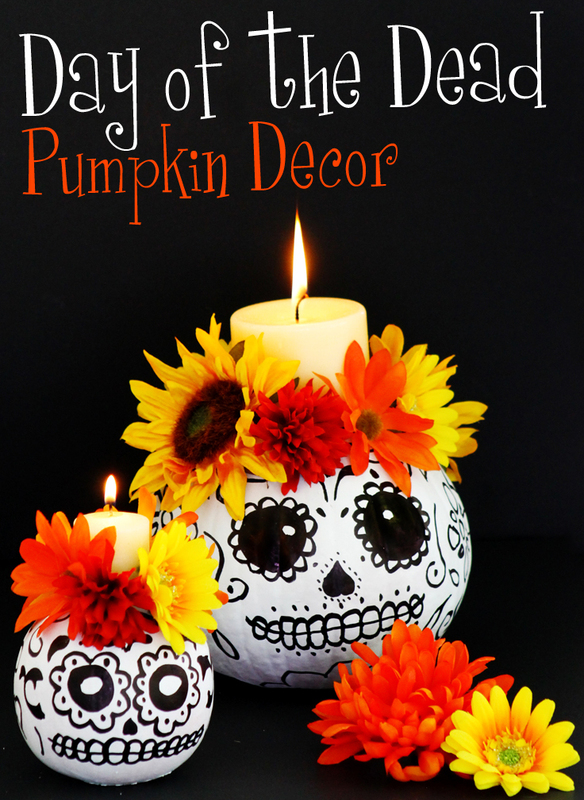 The post Easy to Make Day of the Dead Skull Pumpkin Candle Holders appeared first on Growing Up Bilingual.